Hazro have been producing some interesting and very affordable monitors for a few years now, and we have been fortunate to be able to test these first hand each time a new model is released. In July 2008 we reviewed their 30" offering, the HZ30W, and then later we looked at the updated HZ30Wi in October 2010. As an explanation of the models available at that time, with this update in 2010 Hazro actually released the HZ30Wi in two flavours. There was the 'regular' HZ30Wi and the HZ30WiQ, which used a slightly different panel and a slightly larger colour space coverage. 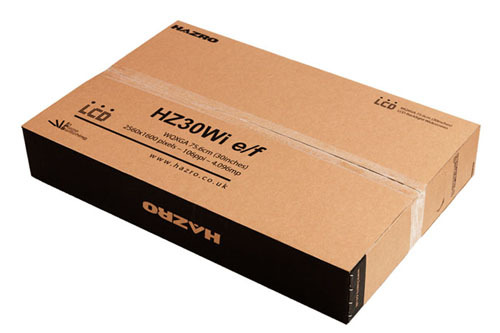 Hazro have since updated their 30" offering again and now offer the HZ30Wi-f and HZ30Wi-e models. The 'F' model is basically the same as the previous HZ30WiQ, but has a new enclosure for the panel and is a different design to the old stock. The 'E' model is an update however, using a newer panel and now offering a true 10-bit colour depth. The panel is really the only thing different between these two models, with the 'F' model retaining the panel used in the old 'Q' model, and the 'E' model now using a slightly different revision of the panel. The enclosure on both the F and E models is the same. We will look at the changes a little later on and discuss the new panel in more detail. Hazro's website markets the HZ30Wi e/f in the following way: "The Hazro HZ30Wie/f 30" WQHD IPS LCD displays are ideal for graphics and visual media, where professional grade technology meets revolutionary design. 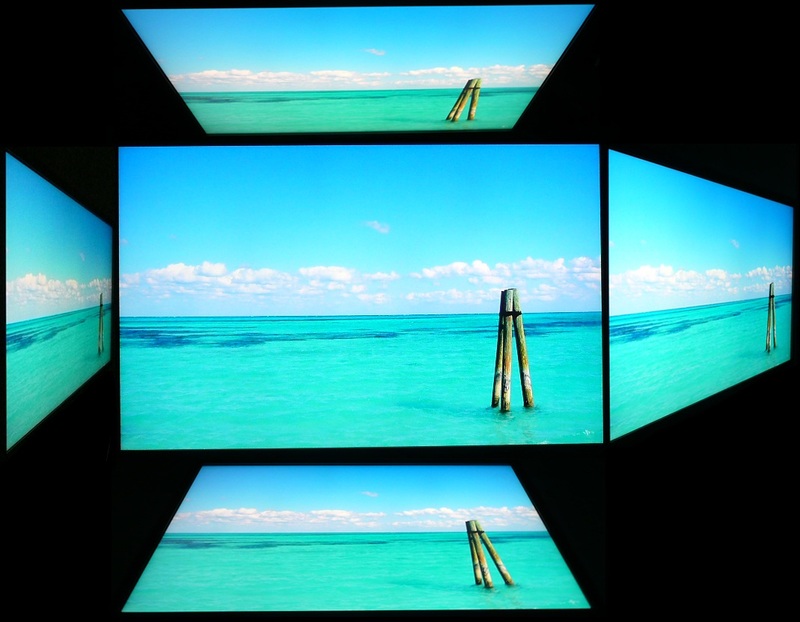 The massive 4MP (2560x1600) WQXGA resolution brings a new dimension to on-screen graphics. For the performance-driven individual, the Hazro HZ30Wi e/f provides the ideal navigation perspective for your desktop in the home or office environment"
Basic brightness control only, no OSD menu. The HZ30Wie/f offers a very basic and no-frills set of connections and features really. There is only a single dual-link DVI interface available to connect to your PC. This is HDCP certified for encrypted content. You must have a DL-DVI connection (note: that's still a single connection socket, just capable of a higher bandwidth than normal DVI) on your graphics card to be able to run this screen at its full 2560 x 1600 resolution and a specific DL-DVI cable which is provided. Hazro have opted to keep production costs down and have therefore not supplied any additional connections. D-sub and HDMI are missing, but wouldn't have been able to handle the full resolution of the screen anyway due to bandwidth limitations of those connection types. DisplayPort could support this resolution and the bandwidth needed, but again it as been left off. This means the HZ30Wie is only really suitable for connecting one PC and not for any external devices. Hazro have done away with the 4x USB ports which were previously available on the back of the HZ30Wi model. None are available on this new model which is a bit of a shame as they are useful for connection of cameras etc I think. There are no other features available such as speakers or card readers either so it really is a no-frills offering. You may notice that on the spec sheet / manual PDF for this screen it lists a 100,000:1 dynamic contrast ratio, but this was in fact removed from this screen due to the lack of any OSD menu or way to turn it on or off. The HZ30Wie is a bit of a re-design compared with the older HZ30Wi model. The previous model had an all black metal bezel and stand, whereas the main enclosure on the HZ30Wie/f is now a dark grey metal finish instead. The stand remains unchanged and is black in design with a fairly thin arm, and a flat base as shown above. The bezel is actually a little wider than its predecessor, now measuring ~20mm along all sides. On a screen as big as this, it still looks pretty thin though. On the front of the screen in the middle of the lower bezel is a small silver coloured Hazro logo. In the bottom right hand corner there is a very small power LED which glows green during normal operation, and red in standby. The screen is ~65mm in thickness (without the stand) and so from the side it can look a little bulky by modern standards. This is due to the use of a CCFL backlight unit though, unlike many modern screens which have switched to LED units. Hazro have actually used an external power brick for this model as well, so it could have actually ended up with a larger profile still if this had been integrated into the screen. You can see the profile of the screen in the image above as well, which is a top-down view from above. The back of the screen is enclosed in a flat black metal. 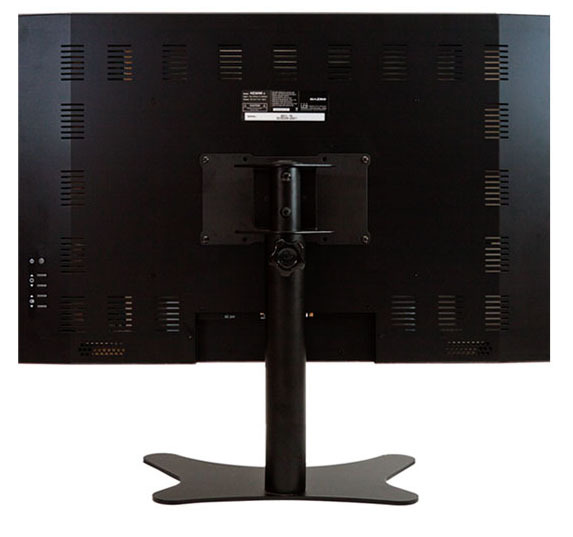 There are screw holes to connect the stand and the screen is also VESA 100 x 100 and 200 x 100mm compatible. On the left hand side (when viewed from behind) there are three buttons, an up and down arrow and the power on/off button. The up and down arrows can be used to control the monitors brightness. As discussed earlier, Hazro have not supplied any USB ports on the back of the screen as on the previous HZ30Wi model. On the back of the screen are the connections for power and Dual-link DVI. The screen comes with a rather bulky external power supply brick and so the connection on the back of the screen is different to a normal kettle lead type. The main screen is packaged in a pretty thin box as shown above, but the stand must be supplied and packaged separately. Above: rear views showing connection of separate stand to the back of the panel. Click for larger versions. It also needs to be connected by the user using the 4 provided screws. 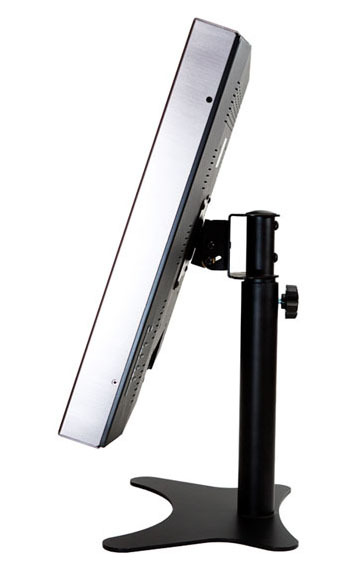 This isn't too tough to do, and once connected it provides a sturdy and rigid stand for the large, heavy screen. Ergonomically you need to take into account the very heavy weight (~11Kg) of this screen and its metal enclosure. The stand does do a good job of providing a strong and sturdy base though, but moving the screen around can be quite difficult. This is not one you would want to regularly move around. There's no real wobble from the screen when its on the desk though which is good. Above: side views showing tilt adjustment range. Click for larger versions. There is a reasonable tilt range available from the stand although you have to loosen and tighten the screw on the side of the bracket with the provided Allen key once it is moved into position. This means that it can become a bit of a pain if you want to regularly move the tilt position of this screen. It is possible to tighten the tilt screw to a point where it will hold the weight at a certain position, and still allow you to make some adjustment to the angle. However, if you plan on leaving it in one position for extended periods of time it would be worth tightening that screw up properly. The screen tilts quite a long way forward as shown above which is not really very useful in practice. The height adjustment is similar as there is a hand screw on the back of the stand which needs to be loosened when you want to change the height, and then tightened again when it reaches the desired level. The movement itself is very stiff and you have to really force it downwards if you are at the maximum height. So much so that it feels like it is really stuck. It offers a range of ~95mm movement and at the lowest setting the bottom of the screen is ~110mm above the level of the desk. This is then is about 205mm above the desk when at maximum height adjustment. There is no side to side pivot available from the stand but there is a full rotation between landscape and portrait. This is actually nice and easy to manoeuvre and is a pleasant experience. You do have to cope with the height function though to be able to rotate the screen fully and I suppose its practicality is probably questionable on a screen this size. Tilt and height are tricky if you need to reposition frequently, but are at least available for initial setup and positioning. Rotate is easy thankfully but has questionable value on a screen this size. Sturdy base and stand. The materials used are of a good standard and build quality feels good, if a little bulky and heavy. It feels a bit industrial but on the plus side it is not made of any cheap plastics and should be pretty robust for long term use. There is a no audible noise from the screen even if you listen closely. The screen coating is a traditional anti-glare (AG) solution. Like other modern IPS panels the coating is pretty aggressive and so does give a grainy feel to light / white images. If this is something that bothers you, you may want to look for a glossy solution of one with a lighter AG coating. Like some of the previous Hazro models, the HZ30Wie doesn't actually offer an OSD menu. Instead there is a basic control only over the intensity of the backlight. This is achieved using the up/down arrows on the back of the screen. This seems to offer 13 defined steps in the brightness of the screen and you can spot each easily with the naked eye. At the top end there also seemed to be a further 6 - 7 "clicks" where it made no change to the brightness of the display. Apart from this there is just the on/off button. When turned on the small power LED on the front of the screen glows green, and in standby it glows red. Without a full OSD menu there are of course a lot of options missing which you would normally have available. 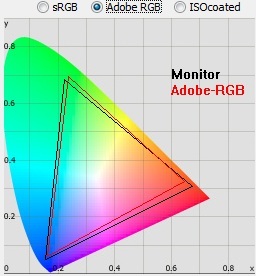 There is no control over the RGB channels, colour temperature, gamma etc. There's no preset modes available and any advanced options like aspect ratio control or dynamic contrast ratio are also left off. It's a shame to not see an OSD menu present to be honest but again it's been left off to cut down costs. It's not uncommon either as Apple screens are the same for example. In terms of power consumption the manufacturers spec states typical usage of <150W in operation. In standby the screen apparently uses <2W. We tested this ourselves and found that out of the box the screen used 160.8W of power while at its default brightness setting which was at its maximum. At the lowest brightness setting, power consumption was reduced to 78.3W. This was also the power consumption after calibration since we had reverted to a 0% brightness setting during that process to achieve as close to our desired luminance as possible. In standby the screen used 2.4W of power. Overall the power consumption of this screen was very high here. It should be noted however that the unit we received was calibrated to a 200 cd/m2 default brightness but Hazro have told us that normal retail stock would be calibrated instead to 120 cd/m2. This would help reduce the power consumption a little, but it is still pretty high compared with other screens of course. The previous HZ30Wi showed a similar power consumption as well, and it is down to the large size of the screen and the use of CCFL backlight units. The Hazro HZ30Wie uses an LG.Display LM300WQ5-SDA1 H-IPS panel which is capable of producing a colour palette of 1.07 billion colours. Referencing the detailed panel specification sheet confirms this is in fact a true 10-bit module with a 10-bit grey scale signal for each dot. This is unlike some other so-called "10-bit" modules which are in fact using an 8-bit panel with an added Frame Rate Control (FRC) stage applied. It's all very well saying a panel is capable of 10-bit colour depth as opposed to an 8-bit colour depth, but you need to take into account whether this is practically useable to you, and whether you're ever going to truly use that colour depth. You need to have a complete 10-bit end to end workflow in order to make use of this which includes a 10-bit supporting application, operating system, graphics card and software. This is still quite rare and reserved really for high end equipment and professional uses. Nevertheless the 10-bit colour support is there for future uses and for if you do have the necessary workflow to support it. The HZ30Wie uses wide colour gamut (WCG-CCFL) backlighting using 18x CCFL tubes, and so the colour space of this screen covers 100% of the sRGB reference and in fact extends considerably beyond this. The detailed panel specification confirms it can cover 102% of the NTSC colour space reference and 98.2% of the Adobe RGB space. A thin white line was shown on an all-black background and a photograph was taken at a slow shutter speed of 1/6 second (in this example) as the camera was scanned left to right in front of the screen. This produces a series of white lines which can be used to identify the frequency of the PWM and how quickly the backlight is cycled on and off. The higher this frequency, the less likely you are to see artefacts and flicker. The duty cycle (the time for which the backlight is on) is also important and the shorter the duty cycle, the more potential there is that you may see flicker. Please remember that not every user would notice a flicker from the backlight but it is something to be wary of. It is also a hard thing to quantify as it is very subjective when talking about whether a user may or may not experience the side effects. We are able to at least measure the frequency of the backlight using this method and tell you whether the duty cycle is sufficiently short at certain settings that it may introduce a flicker to those sensitive to it. The HZ30Wie showed a cycling frequency of ~168Hz (28 lines at 1/6 second shutter speed) in the initial tests shown here. A further test at an even slower shutter speed allowed us to more accurately record the cycling frequency at approximately 188Hz (47 lines at 1/4s shutter). At 100% brightness there should be no flicker evident as the backlight is not cycled on and off using PWM. At lower settings PWM is used and the duty cycle becomes progressively shorter. Given the relatively low frequency of the PWM cycling compared with some other displays (e.g. PWM of 300Hz+), there is a chance that flicker may be evident to some users as you lower the brightness setting as a result. We wanted to briefly talk about an issue we experienced with our sample when working at lower brightness settings. This was particularly noticeable when brightness was set to 200 cd/m2 and lower (see calibration sections for details), and it made no difference whether we had an active ICC profile or not. At lower luminance settings and in certain situations you could spot a strange 'ripple' or 'wavey shimmer' across the screen. This was particularly noticeable on solid backgrounds, especially grey, but at the lowest settings it was even visible during normal everyday use. I have tried to capture this as best I can in the above video, and it's actually a reasonable reflection of how it looks on a dark grey background in practice. It is quite distracting and you need to adjust the brightness to remove it. This seems to be an issue relating to the backlight but if your screen suffers from this at all you should be able to arrange an RMA to swap it out. 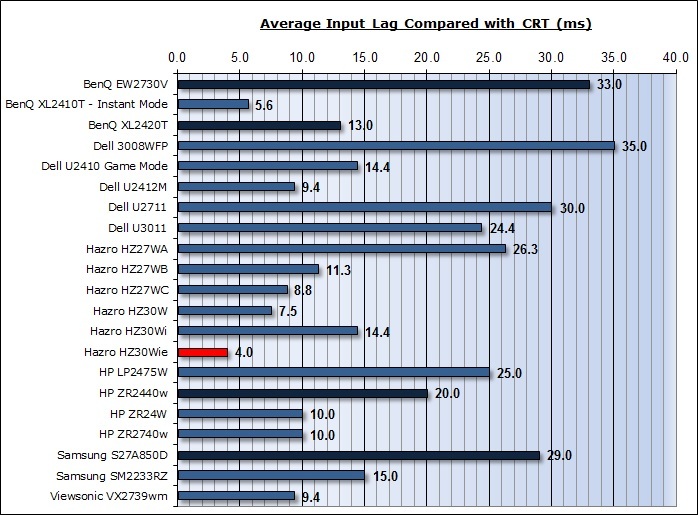 The out of the box performance of the HZ30Wie was moderate and pretty reasonable in most areas. On the unit we tested the screen was painfully bright however which you could immediately spot. More on this in a moment and as the review progresses. Colours felt pretty even though and the colour temperature felt pretty good and no too red of blue. We tested the screen using the X-rite i1 Spectrophotometer at default settings first. The CIE diagram on the left confirms that the monitors colour gamut (black triangle) stretches considerably beyond the sRGB reference (orange triangle) thanks to its wide gamut CCFL backlight unit. It offers a much wider range of green and red shades in particular. We have also provided a comparison of the colour space of the screen against the Adobe RGB reference to which it is reasonably close. It does not quite cover some green shades but does extend past Adobe RGB in some red shades in this 2D view of the gamut. It should be noted that the HZ30Wie offers no emulation for smaller colour spaces and so the screen must always be used in wide gamut mode. As a result, you need to consider whether you want a wide gamut screen and whether you intend to work with wide gamut content. 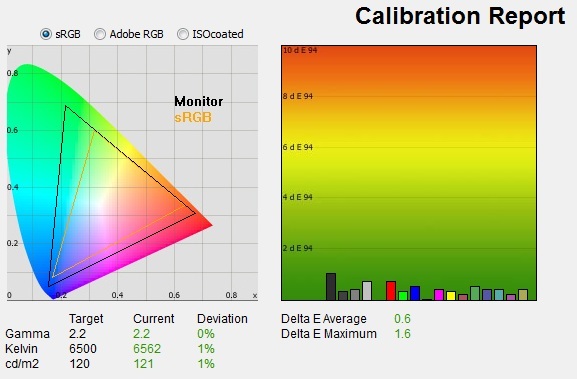 If you do, and therefore need a wide gamut screen then this is of course fine, and the screen quite closely matches the popular Adobe RGB space in fact as the above tests confirm. If you are working simply with "normal" sRGB content then viewing that on a wide gamut screen can lead to oversaturation of colours, and certain shades can look unrealistic or too neon. Reds and greens for example can look very bright and skin tones can look strange. 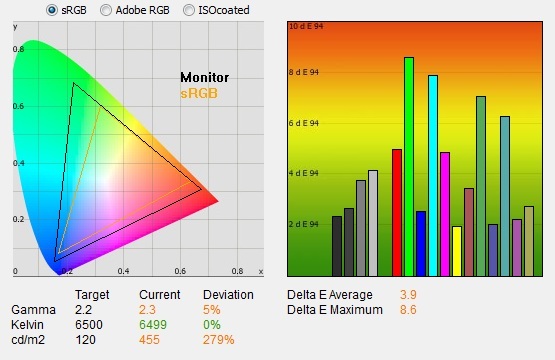 Some users actually like the bright, vivid colours anyway especially in games and movies, but others who are looking for accuracy and who don't want to deal with the complications of a mis-match between their workflow and their screen may instead want to consider a monitor with a standard sRGB gamut. Some rival monitors with wide gamut support offer sRGB emulation modes which can at least offer the user the ability to switch between the two if needed. Because of the drive to keep costs at a minimum here, there is no emulation mode provided here. The gamma of the screen was pretty well set up with an average gamma of 2.3 being recorded, with a deviance of only 5% from the target of 2.2. The gamma curve was more accurate in darker grey shades as you can see from the above table, and strayed a little further from the target in lighter shades. White point was recorded at 6499k being basically spot on to the target of 6500k. As we had identified with the naked eye the screen was far too bright and was recorded at a very high luminance of 455 cd/m2 which was actually a lot higher than the specified maximum even of 370 cd/m2. Through conversations with Hazro we actually identified that this sample was actually calibrated in the factory at a higher than normal brightness setting for a particular client. So retail stocks may vary a little. We will talk about this a little more in the contrast stability section, but needless to say, if you set the monitor at its maximum setting it will be eye-scorchingly bright! At this very high default brightness, black depth was measured at 0.63 cd/m2, giving us a static contrast ratio of 720:1. This was moderate for an IPS panel, but not as high as some other models we have tested which have reached up to around 1000:1. Default colour accuracy was mediocre with an average dE of 3.9 but a maximum of 8.6. You will certainly need to turn down the brightness of this monitor, and some kind of profiling would be beneficial to correct the slight gamma variations and the colour accuracy. Even though there is no OSD menu to adjust settings at a hardware level it is possible to make corrections through profiling and adjustments at a graphics card level. Adjustments were made during the process only to the brightness control since this was all that was available from the screen, in the absence of a full OSD menu. After this I let the software carry out the LUT adjustments at a graphics card level and create an ICC profile. 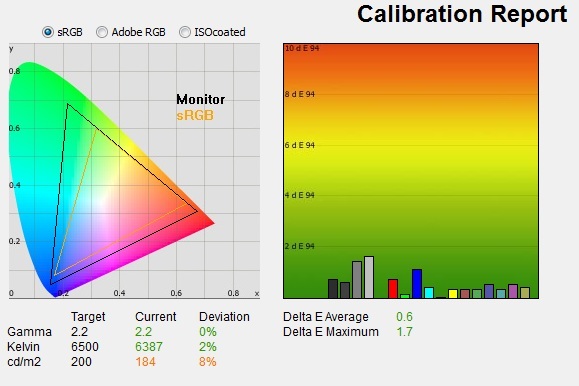 The screen does not feature a hardware LUT calibration option so other than the brightness alterations, the rest of the process is carried out at a graphics card level in profiling the screen. In most areas, the calibration could be considered a success. Gamma was improved and was now 2.2 on average. White point was within 1% of the target at 6562k, and colour accuracy was improved nicely with dE average of 0.6, and maximum of 1.6. During the calibration we had had to change the brightness control to its minimum setting and the software profiling had managed to achieve a luminance of 121 cd/m2, very close to the target set of 120 cd/m2. However, in doing so, adjustments had been made to the digital white/black levels at a software level (similar to changing the brightness slider of the graphics card). While this had managed to reduce the luminance of the screen to reach the target set, it had crushed the contrast ratio significantly to ~ 434:1. This was far from ideal and so we would ideally need to find a minimum luminance for the screen where it could be calibrated without crushing the contrast. We would be limited therefore by the minimum adjustment range of the backlight which we will look at now. I wanted to see how much variance there was in the screens contrast as we adjusted the monitor setting for brightness. In theory, brightness and contrast are two independent parameters, and good contrast is a requirement regardless of the brightness adjustment. Unfortunately, such is not always the case in practice. We recorded the screens luminance and black depth at various brightness settings, and calculated the contrast ratio from there. Graphics card settings were left at default with no ICC profile or calibration active. Tests were made using an NEC branded and customised X-rite i1 Display 2 colorimeter. It should be noted that we used the BasICColor calibration software here to record these, and so luminance at default settings may vary a little from the LaCie Blue Eye Pro report. The luminance range of the screen was controlled through a very wide range of ~230 cd/m2. At the top end the maximum luminance returned from our sample unit was a whopping 440 cd/m2, which was even a lot higher than the specified maximum brightness of the panel at 370 cd/m2. We have used the clearly defined 13 steps in the monitors brightness control here and as this was reduced, the luminance was reduced quite nicely. At the lowest setting the screen reached down to ~210 cd/m2. It should be noted here that the sample we had been sent had been factory calibrated with a minimum luminance of around 200 cd/m2 for a particular client. Through discussions with Hazro we established that other retail stock units would be set at 120 cd/m2 and so the minimum luminance achievable would be around this mark. The backlight adjustment range should be approximately the same and so the brightness control of a normal retail unit should be able to alter the luminance between about 120 and 350 cd/m2. On our unit, a minimum luminance of ~210 cd/m2 would present problems for anyone wanting to work at a lower luminance. In fact at ~210 cd/m2 we found the screen to be a little too bright for prolonged use. While we were unable to adjust the luminance any lower through the control of the backlight, we were able to achieve a lower luminance through software adjustments as discussed in the previous section. Anyway, the point here is that the minimum and maximum luminance readings here need to be taken with a pinch of salt due to the particular unit tested. It does however show that the backlight range is very good. You may want to also consider that on a normal retail unit, the lowest brightness setting is apparently ~120 cd/m2 and so if you needed to use the screen at anything darker, or in darkened room conditions, you wouldn't be able to control the monitors backlight any lower. You could make further adjustments at the graphics card level as we had done in the first calibration test above, but this would be at the cost of contrast ratio. 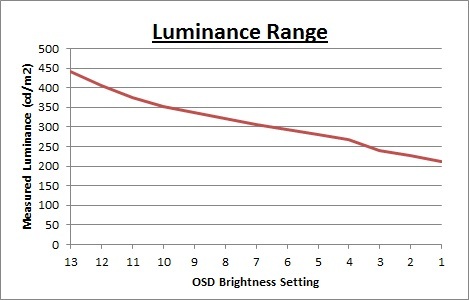 The plot of the luminance on the above graph shows that the adjustment of the backlight is not quite linear. At the top end of the range each step in the brightness control gives a slightly steeper adjustment in the luminance of the display. Overall though, the screen behaves as it should, with a reduction in the brightness control leading to a reduction in the overall luminance of the screen. The contrast ratio remained very stable across the range of brightness adjustments which was pleasing. The average contrast ratio was 726:1 which is reasonable, but not great for a modern IPS panel. 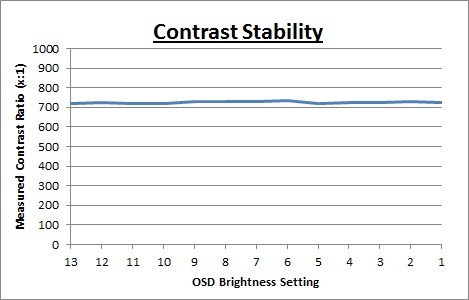 This contrast ratio and stability should be the same on 120 cd/m2 calibrated units as well, as only the brightness adjustment range is affected. The relationship between white and black, and therefore the contrast ratio, will remain unaffected. So given that we have established this particular unit had a minimum brightness setting of ~210 cd/m2 we wanted to carry out a calibration to a higher luminance than our usual 120 cd/m2 so as not to crush the contrast ratio unfairly through graphics card adjustments. Potential buyers can ignore our first calibration above, where 120 cd/m2 was achieved but with a very low contrast ratio. On a normal retail screen, because the backlight should control you down to ~120 cd/m2 anyway, you should be able to achieve a calibration much closer to the following tests, just with a lower luminance close to 120 cd/m2. Within the calibration software we defined a target luminance of 200 cd/m2 this time so that the software did not try to reach a lower 120 cd/m2 and therefore crush our contrast ratio. Again the profiling of the screen had produced some pleasing results and corrected some of the discrepancies from the default setup. Gamma was now nicely corrected to 2.2 average and white point remained very close to the target, now being slightly out at 6387k (2% deviance). The luminance has been measured at 184 cd/m2 now and we know that the software should not have crushed the contrast ratio through excessive digital white/black level adjustments. Indeed the calibrated contrast ratio was now 679:1, only a little lower than the default of 726:1. This was again ok, but not great for an IPS panel unfortunately. The colour accuracy was again improved, with dE average now 0.6, and maximum 1.7. LaCie would consider colour fidelity to be excellent on average. This is the kind of performance a potential buyer should be able to achieve from the screen, just at a lower luminance thanks to the lower factory adjustment of the backlight. Testing the screen with various colour gradients showed very smooth transitions with only some very slight gradation being evident. There was no temporal noise evident since this screen is not using any frame rate control techniques. You can use our settings and try our calibrated ICC profile if you wish, which are available in our ICC profile database. Keep in mind that results will vary from one screen to another and from one computer / graphics card to another. Although the profile was created with a target luminance of 200 cd/m2 you should still be able to apply it to correct gamma curves and colour tones (or attempt to), and then just alter the brightness control to suit. Changing the brightness control will not impact the rest of the profile setup, only adjust the luminance and black point of the screen so you can alter that to whatever is comfortable to you as a user. 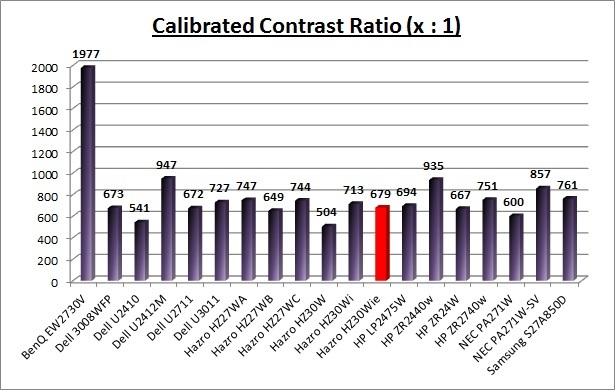 I've provided a comparison above of the HZ30Wie against some of the other screens we have tested. Out of the box average dE was 3.9 which was not too bad actually compared with other screens, and even a little better than the older HZ30Wi (dE average 4.5) and HZ30W (4.5) models. Compared to some of the other screens we have tested it was a little behind though at these default settings. 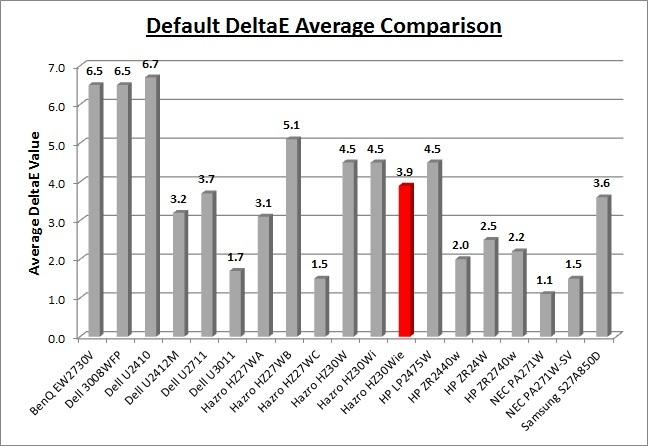 The Dell U3011 is an obvious competitor and offered a very good factory calibration with dE average of 1.7. Some of the 27" models also performed very well including Hazro's own HZ27WC (1.5) and the HP ZR2740w (2.2). The professional grade 27" NEC PA271W and SpectraView Reference 271 were better still at 1.1 dE and 1.5 dE average respectively. Some form of software profiling using a colorimeter would be useful to correct the colours and also any other discrepancies in the gamma and white point. Once calibrated the dE average was reduced to 0.6. This would be classified as excellent colour fidelity by LaCie. It was not quite as low as some of the other screens here which reached down to 0.2 average, but in practice you would not notice any real difference here. Some of the professional range models from NEC are even more accurate. 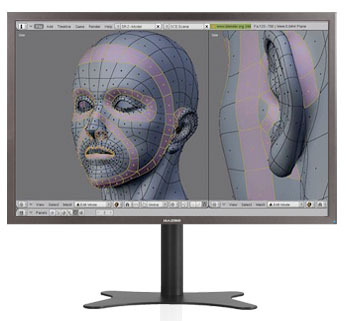 Professional grade monitors like the NEC PA series and P241W also offer other high end features which separate them from some of these other models, including extended internal processing, 3D LUT's and hardware calibration. These comparisons are based on a small selection of tests, so it should be remembered that other factors do come into play when you start talking about professional use. For further information and tests of a high end professional grade screen with hardware LUT calibration, you may want to have a read of our NEC SpectraView Reference 271 review. We have not provided the usual comparison of calibrated black depth here since it was not possible to measure this fairly when luminance was calibrated to 120 cd/m2. 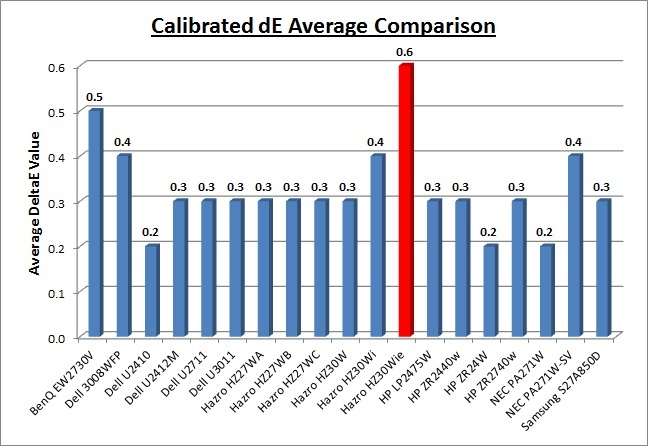 The calibrated contrast ratio of the HZ30Wie was ok, but not great by modern IPS standards. The contrast ratio was 679:1 after calibration which was comparable to some other screens including the older HZ30Wi (713:1) and also the Dell U3011 (727:1). Some other smaller IPS panels are capable of higher contrast ratios though, such as the Dell U2412M (947:1) and HP ZR2440w (935:1). 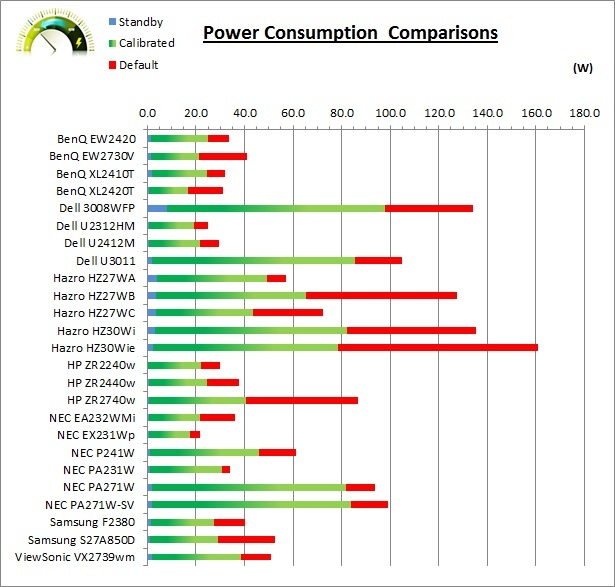 Other technologies such as PVA and MVA can offer very impressive contrast ratios, ranging up to 1977:1 in this comparison for example on the BenQ EW2730V (AMVA based). On some other screens the static contrast ratio of modern MVA and PVA panels can reach even higher, up to ~3000:1 which IPS cannot compete with at the moment. Viewing angles of the HZ30Wie were very good as you would expect from an IPS based panel. Horizontally there was very little colour tone shift until fairly wide angles past about 45°. Contrast shifts were slightly more noticeable in the vertical field but overall they were very good. The screen did offer the wide viewing angles of IPS technology and was free from the very restrictive fields of view of TN Film panels, especially in the vertical plane. It was also free of the off-centre contrast shift you see from VA panels. On a black image there is a characteristics IPS white glow, but in normal working conditions this shouldn't present too much of a problem. The above image was taken in a darkened room to demonstrate the white wide angle glow when viewing a black screen. There is no A-TW polarizer on this panel which is rarely used now in the market but was implemented on some older screens to improve the off centre black viewing. If you are viewing dark content from a close position to the screen you can sometimes see this pale glow on parts of the screen towards the sides and corners because of your proximity to the screen and your line of sight. This is accentuated a little due to the sheer size of the 30" panel. The edges of the screen are at an angle from your line of sight which means you pick up this white glow to a smaller degree. This disappears as you move backwards away from the screen where the line of sight does not result in a wide angle view of parts of the screen and you can see the screen largely from head on. That is a little difficult to explain but hopefully makes sense. It is only really apparent on darker content and only really if you are working in darkened lighting conditions on this model. It was not too severe. Measurements of the screens luminance were taken at 35 points across the panel on a pure white background. The measurements were taken using BasICColor's calibration software package, combined with the NEC customised X-rite i1 Display 2 colorimeter. The above uniformity diagram shows the difference, as a percentage, between the luminance recorded at each point on the screen, as compared with the reference point in the centre of the screen. Usually this would be a calibrated 120 cd/m2 but since this was not possible through the adjustment of the backlight control on our sample we instead just opted for a default minimum brightness which was measured in this case at 210 cd/m2 in the centre. The below shows the variance in the luminance across the screen compared with this point as a percentage. It is worth noting that panel uniformity can vary from one screen to another, and can depend on manufacturing lines, screen transport and other local factors. This is only a guide of the uniformity of the sample screen we have for review. The luminance uniformity of the HZ30Wie was ok on the most part, but there was a rather obvious, and quite large, deviation along the left hand side of the panel. 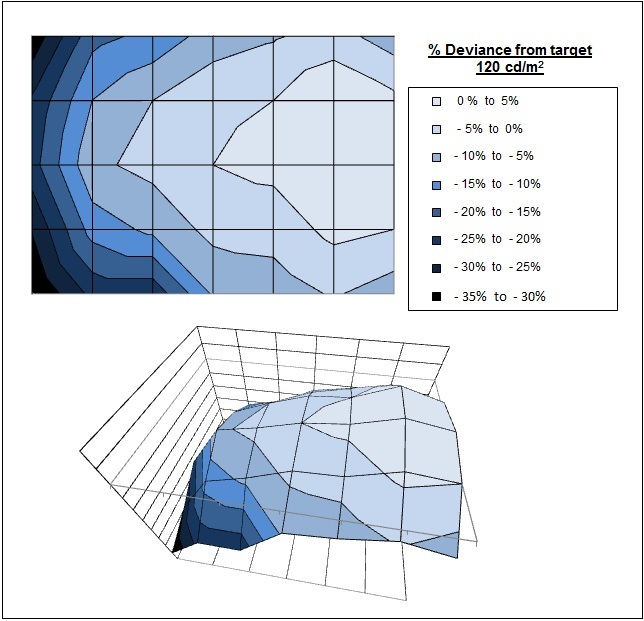 Approximately 70% of the screen was within 10% deviance of the central point, but this was almost entirely in the central and right hand regions. Along the left hand edge there was a big drop in the luminance recorded, where is reached as low as 155 cd/m2 in the most extreme cases (remember the central point was 210 cd/m2 here). The left hand edge was on average 29% out from the central measurement and so showed a fairly big variation. This was a bit of a shame but of course results may well vary. As usual we also tested the screen with an all black image and in a darkened room. A camera was used to capture the result. The overall appearance of the screen in this test was good really, with only some slight pale clouding towards the corners of the screen. This was most apparent in the bottom left and right hand corners as you can pick out from the photo. There was no severe backlight bleed along any of the edges thankfully so no real issues here. The Hazro HZ30Wie features a massive 2560 x 1600 resolution which is even a little more than the growing range of 27" screens in the market (2560 x 1440). This means it offers a desktop real estate which is a little more vertically and maintains a 16:10 aspect ratio as opposed to the 16:9 of a 27" screen. With such a high resolution the screen has a 0.2505 mm pixel pitch which is a little larger than the aforementioned 27" models (0.233 mm) as well. This means text size is a little bigger but it is still very small compared with most smaller screens that you may be used to. I'd advise caution if you are coming from a 19" or 22" screen perhaps where the pixel pitch and text are much larger. I still personally prefer the slightly larger text of a 24" model myself, but I expect I could happily get used to the added resolution on these models given time. The extra screen size also takes some getting used to over a few days as there really is a lot of room to work with. It's hard to explain just how big a screen this is as well, but needless to say it does offer a massive upgrade from a smaller model such as a 24" screen. The massive resolution is really good for office and general use, giving you a really big screen area to work with. It is a noticeable upgrade from a 24" 1920 x 1200 resolution for instance. For those wanting a high resolution for CAD, design, photo work etc, this is a really good option. The image was very sharp and crisp and text was very clear over the digital DL-DVI interface. There is no analogue input offered here to compare with because of the high native resolution of the panel and the fact Hazro have opted to leave all other connections off this model. Given there is no OSD menu there are no preset modes available here, so you will need to use the same setup for office work as you might for movies or games. The only control you do have at your disposal from a hardware point of view is the brightness adjustment. This does offer a wide range of adjustments at least. I won't penalise the screen we tested for its relatively high minimum brightness (~210 cd/m2) since the normal retail units should be able to reach down to ~120 cd/m2. You will probably want to run the screen at its minimum brightness for office and comfortable prolonged use. Hazro tell us that the minimum adjustment on the retail units is 120 cd/m2 so if you are wanting to use the screen in darkened conditions or at a lower luminance you may struggle here. The HZ30Wie offers a good range of ergonomic adjustments for obtaining a comfortable position for every day viewing. The tilt and height functions are difficult to use regularly though due to the way they operate, and the fact you have to tighten and loosen screws to move it around. It's not one for being able to easily offer regular changes. The rotate function is there is you want it, but on a screen this size its practical use is questionable I think. There are no USB ports on this model which is a shame as they are often useful for connecting cameras, webcams, scanners etc in the office environment. Again, this is a fairly no-frills offering to allow costs to be kept very low. The screen is designed to run at its native resolution of 2560 x 1600 and at a 60Hz recommended refresh rate. However, if you want you are able to run the screen outside of this resolution. We tested the screen at a lower 1920 x 1200 resolution while maintaining the same aspect ratio (16:10) to see how the screen handles the interpolation of the resolution. At native resolution the text was very sharp as you can see from the top photograph. When you switch to a lower resolution the text is more blurry of course. There was fairly high levels of overlap of the pixels but text was still reasonably readable. Native resolution is recommended where possible of course for optimum picture quality. The Hazro HZ30Wie was tested using the chase test in PixPerAn, a good bit of software for trying to quantify differences in real terms responsiveness between monitors. As a reminder, a series of pictures are taken on the highest shutter speed and compared. The images below show the best case example on the left hand side, and the worst case example on the right hand side. This should only be used as a rough guide to comparative responsiveness but is handy as a way of keeping a constant test of each screen. The HZ30Wie is rated by Hazro with a 6ms G2G response time. This indicates the use of Response Time Compensation (RTC) technology, also known widely as 'overdrive'. This technology is used to boost pixel response times across grey transitions and should help improve overall responsiveness in practice of a panel, as compared with a version without any RTC. 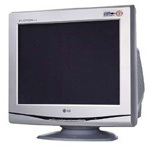 The HZ30Wie uses an LG.Display LM300WQ5-SDA1 panel which is actually rated by LG.Display with a 7ms G2G response time average, ranging up to 17ms G2G maximum. Without the overdrive circuit applied the panel itself would be rated with a 12ms ISO response time. If any of these figures are new to you, please have a read about response time in our specifications section of the site. On to the PixPerAn tests anyway. As you can see, the HZ30Wie performed pretty well in practice. There was no obvious ghosting of the moving image and only fairly low levels of motion blur were evident. In reality the panel performed very comparably to the older HZ30W and HZ30Wi models, but that isn't a bad thing as they were always pretty responsive anyway. There is thankfully no noticeable overdrive overshoot in the form of dark or pale halos and trails. This suggests a well controlled, and not too aggressive overdrive impulse has been applied. Considering this is an IPS panel, and is not a model really aimed at gaming, it was a pleasing result. The Dell U3011 is obviously a key competitor to the Hazro 30" series, and in these tests again performed very similarly. In fact the Dell is using a very similar panel to the HZ30Wie anyway. I have provided a comparison of the HZ30Wie against some other popular models, this time 27" in size. The responsiveness of the 27" IPS based Hazro HZ27WC was slightly ahead of the HZ30Wie with a slightly less pronounced blur to the moving image. The other IPS models here are the HP ZR2740w and the Dell U2711. The HP was a little slower than the HZ30Wie with a slightly more prevalent blur, which is picked up by the camera quite well. The Dell U2711 is a little faster, with a slightly sharper moving image. However, the aggressive overdrive impulse has lead to a dark overshoot behind the moving car which can be distracting. The HZ30Wie shows no overdrive overshoot or artefacts in our tests. 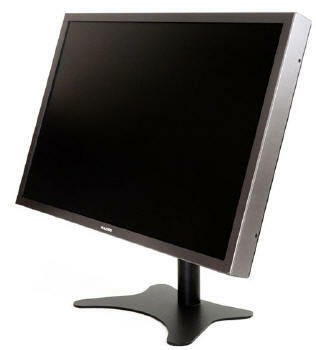 The other models here are the AMVA based 27" BenQ EW2730V. I have included this for comparison to demonstrate that unfortunately the responsiveness of modern AMVA panels is somewhat behind current IPS panels. There is a much more obvious blur and ghost image on that model, even though its rated with an 8ms G2G response time. This goes to show you can't always rely on specs to give you a true idea of how a panel will perform in real life. The last model is the Samsung S27A850D which is based on Samsung's new PLS panel technology. This model shows a very low level of motion blur and is in fact a little ahead of the HZ30Wie. Above is a comparison of the HZ30Wie against some popular models in smaller sizes. Again these other 3 models are IPS based. The HP ZR2440w had performed very well in these tests and showed a slightly lower level of motion blur to the HZ30Wie in practice. There was a very slight dark and pale halo trail evident in those tests but it was very slight. The Dell U2412M and U2312HM again offered low levels of motion blur but a more obvious dark overshoot trail was introduced. The HZ30Wie seems to compare quite well to other IPS panels. It is a little slower than some models, but is at least free from any annoying overshoot. I've also included a comparison above against 3 gamer-orientated screens, including the 27" TN Film based ViewSonic VX2739wm. While it is only a little smaller in size, it is very different to the Hazro of course. That model is aimed primarily at gamers and even has a 1ms G2G quoted response time. However, it uses a TN Film panel and offers a much smaller resolution of 1920 x 1080. It performs a little better than the HZ30Wie in these tests and some of the remaining motion blur is eliminated. The other two models here both featuring heavily overdriven TN Film panels, and are combined with 120Hz technology. The pixel responsiveness of both of these is ahead of the HZ30Wie as well, but more importantly the 120Hz frequency allows for improved 120fps frame rates and the support of 3D stereoscopic content as well. The recently tested BenQ XL2420T offers some very fast performance and is a screen purely aimed at gamers. The Samsung 2233RZ arguably remains our champion purely on the responsiveness tests. Both these screens perform faster in practice though thanks to their 120Hz support, giving you smoother moving images and higher frame rates. The responsiveness of the HZ30Wie was very good really considering this is a large IPS panel and was not really aimed at gaming at all. It performs very much like its predecessors and shows pretty low levels of motion blur in practice. While the spec of the screens has changed from 12 > 8 > 6 ms G2G, the panels used and overdrive circuits have all worked very well over the years, so not a massive amount has changed in practice. Thankfully the screen is free from any nasty overshoot or artefacts and so should be fine for some reasonable gaming. Keep in mind that you will need a pretty powerful graphics card to cope with the demands of such a high 2560 x 1600 resolution. Aspect Ratio Control - The screen is lacking any OSD menu and so does not offer any options for hardware level aspect ratio control. There is no scaler provided and so scaling of the image would need to be handled by the graphics card. If you want any form of aspect ratio retention or 1:1 pixel mapping you will need to rely on the capabilities of your graphics card, and not the monitor itself. Preset Modes - Again, with no OSD menu there are no preset modes available. You will need to set up the screen to a comfortable level for your day to day use and stick with it. The brightness control is there at least and is easy to use, so you could at least bump up the brightness in games if you need to. The Hazro HZ30Wie showed a very low lag of only 4ms on average. This was incredibly low and would leave us to conclude that there is practically no signal processing lag from the monitor, and that the experienced 4ms lag is almost entirely based on pixel response time. This would make sense given the lack of any scaler or signal processing by the monitor, and it instead provides a direct signal to the panel. With a lag of 4ms average the screen should be perfectly fine for even fast paced gaming, and has therefore been categorised as CLASS 1. 30" screen size makes it a pretty good option for an all-in-one multimedia screen and comparable to smaller LCD TV's in size. A screen this big really does help lend itself to video viewing. Sadly no additional interface options provided. HDMI and DisplayPort are missing which is a shame, particularly if you were keen to connect external Blu-ray players etc. Contrast ratio was ok for an IPS panel but not great. It should be adequate for movie use and on the most part detail in darker scenes and shadow detail should not be lost. Dynamic contrast ratio is not available on this model. Those who like this feature might miss it. There are no preset modes available due to the lack of an OSD menu. 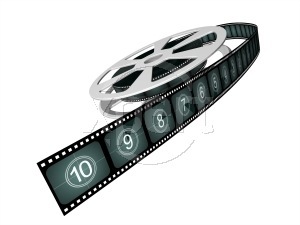 As such, you will need to use your normal setup for movies as well. You can at least quickly and easily bump up the brightness if you need to using the basic backlight adjustment controls. Good ergonomic adjustment range offered by the screen on paper, but in reality some of them are very hard to use. The tightening screws for tilt and height might be a pain and it could prove difficult to obtain a comfortable position if you are watching from various locations and angles and keep needing to move the screen. No integrated stereo speakers or audio connections offered so you would need a separate sound source to this screen. For PAL sources, we have tested the screen and it will not support the full native resolution of 2560 x 1600 at 50Hz refresh rate. The Hazro HZ30Wie was really everything I expected it to be, based on the specs provided and on my previous experience with the other screens in their range. Hazro have done another good job of providing a low cost solution with some decent performance here. On the negative side, to do that they have of course had to make some fairly noticeable sacrifices. There was a distinct lack of connection options here, with only DL-DVI being available. There were no extras, not even USB ports which had featured on previous versions of the 30" screen. There wasn't even an OSD menu here, which meant a very limited control over the hardware and the absence of many options we are now accustomed to seeing, such as dynamic contrast ratio, RGB control, preset modes etc. By removing all these extras and options it did feel quite a basic and no-frills model, but then I suppose we can't hold that against them too much given that was ultimately the aim anyway. However, there were a couple of areas which were a little disappointing, including the pretty stiff and tricky to use stand adjustments. The backlight range was limited at the lower end, certainly on our sample and probably even on retail stock as it is expected to only offer an adjustment down to ~120 cd/m2 even then. On the plus side, the picture quality was very good and default setup was reasonable apart from the very bright backlight. Contrast ratio was very similar to the previous models and wasn't quite as good as we'd have hoped, but was ok. The wide gamut support is obviously useful for those wanting to work within an extended colour space, and it was impressive to see a 10-bit panel used. These features might be useful to some potential buyers. Sadly for others, the lack of an sRGB emulation mode means you could struggle if you are only working with standard gamut content, a common problem for wide gamut screens. Viewing angles were very wide thanks to the IPS panel technology, and the massive resolution and screen size offered a huge desktop to work with. The pixel responsiveness was very good, and input lag was incredibly low as well which was great to see. The design was quite industrial, but was sturdy and strong in its metal enclosure. 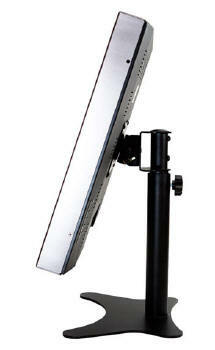 The stand, despite it's annoying adjustment problems was sturdy as well which was vital given the very heavy screen. Of course the main positive for the HZ30Wie is its price. At the moment the screen retails for ~£720 GBP in the UK which makes it quite a lot cheaper than competing models like the Dell U3011 (£900) and HP ZR30W (~£1000). If you don't mind some of the missing features and want a wide gamut 30" screen with some pretty nice all round performance the Hazro HZ30Wie is an interesting option.